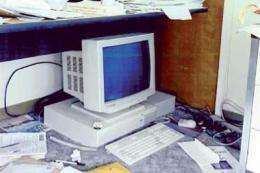 The arXiv server in the early 1990s. The scholarly database is now operated by Cornell University Library. Two decades ago, Paul Ginsparg, Cornell professor of physics, launched an electronic database to let fellow physicists share unpublished academic manuscripts without photocopying and paper mail. Fast forward through the start of the Internet age, and the archive with humble beginnings now contains 700,000 texts serving a million downloads a week. In advance of the 20th anniversary of arXiv, housed at and operated by Cornell University Library, Ginsparg writes about the future of scholarly communication in a Nature commentary piece published online Aug. 11. "To reflect on arXiv is to reflect on a research world transformed by a two-decade revolution in information technology, with vast quantities of literature and associated resources now available on demand," Ginsparg wrote. There is still debate today on how to implement quality control of scholarly work, how to fund it and how best to support scientific reproducibility, he explained. Ginsparg also discussed the influx of scholars in fields beyond the original community of physicists now uploading articles to arXiv in math, astrophysics and biology. Academics in various fields differ in their attitudes to such pre-publishing repositories; in 1997 Ginsparg gave a talk to a group of biologists that catalyzed the formation of PubMedCentral, run by the U.S. National Institutes of Health. Unlike arXiv, however, PubMed does not host unrefereed materials. For the anniversary, Cornell University Library will host an event Sept. 23 that will include a talk by Ginsparg about the past and future of arXiv and meetings with publishers, societies and arXiv's scientific advisory board.